One of my favorite teaching methods is the Harkness discussion. It doesn't hurt that I met my husband at the conference where I learned how to use Harkness in my classroom. Yes, that's right, we were in the conference talent show together doing a juggling show. (Too cute, I know). But that's not the only reason I like Harkness. I created the video below to give you a short introduction if you've never heard of it. It doesn't take long to put it into action in your classroom, and your students will learn so much about not just the material, but group dynamics. A Harkness discussion is basically a roundtable discussion in which everyone has an equal voice. While the teacher works hard to create circumstances in which every student feels comfortable speaking, the teacher rarely jumps in with explanations or to fill an awkward silence. The students take ownership for the conversation, and the course material flows from their thoughts and opinions. Though some classrooms use Harkness exclusively, it is also an excellent tool to add to a wider pedagogy. 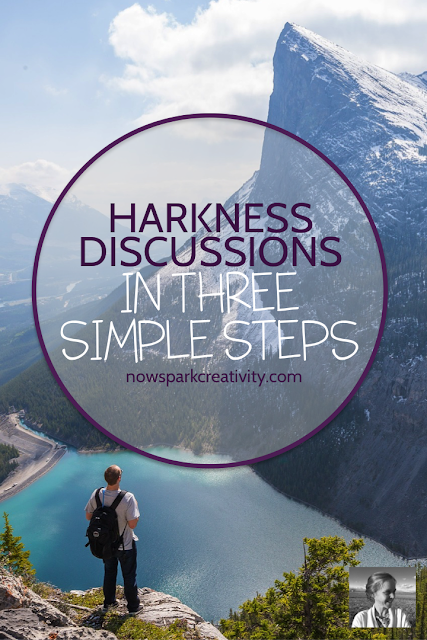 I like to do Harkness discussions once or twice a week, so that my students have a chance to work on expressing their opinions and learning to listen but so that discussion skills don't dominate our whole curriculum. In my experience, a focus that deep on discussion is awfully hard on my students who are naturally quieter. If you'd like to try Harkness, I suggest you dive right in! You don't have to have it mastered before experimenting. Just follow the three simple steps below and you will learn as you go. 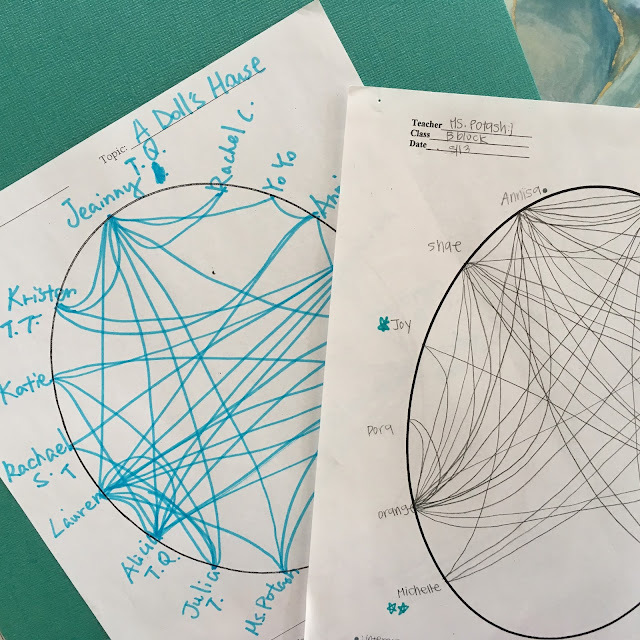 Arrange your classroom in such a way that every student in the discussion can see each other. Maybe you have pillows on the floor, tables pushed into a circle, or desks arranged in an oval. Explain to your students that you are going to try a student-led discussion method. Ask them to help you brainstorm a list of the type of behaviors that will lead to a good experience for everyone. Give them a few examples (i.e. everyone gets a turn to speak, people listen instead of interrupting, everyone respects each others’ opinion, staying on topic, referencing the text, paying attention, taking notes, etc.). Show everyone a circle discussion chart (print!) and explain how to write everyone’s names in around the circle. Ask for a volunteer to be the first observer - this person does not participate in the discussion. Ask this observer to fill in the chart, paying attention to the discussion and getting ready to tell the class about how it went at the end, giving at least one positive observation and one suggestion for improvement. You’re ready! Ask everyone to write down a question in their notes that they might wish to ask during the discussion. Then let someone begin and see what happens. There may be a variety of issues in the first discussion, but refrain from diving in to rescue the dynamics or fill awkward silences. The observer will be sure to comment on some of this. Then, before your next discussion, review the previous observer’s suggestion. As you continue to have discussions, you will be amazed at how they improve based on the students’ own feedback and observations. Want to know more about my experience with Harkness? I wrote all about it for Independent School Magazine last year. Check out the complete article, "Learning to Share," here! I find that doing a discussion warm-up activity helps get Harkness discussions off to a good start. That way the students have their minds on topic and their thoughts organized. I've put together fifteen of my favorites in a free downloadable PDF for you. This isa a great idea!